If you’re like most women, you think of pumpkin just twice a year: once as a glorified candleholder come Halloween and then again as the indulgent finishing touch to your Thanksgiving dinner feast. But this big orange orb is actually one of nature’s nutritional powerhouses -- it’s packed with more than 100 therapeutic nutrients that can boost your beauty routine and enhance your health, including skin-protecting beta-carotenes and disease-fighting antioxidants. Here are the top reasons this gourd’s goodness is a treat you should indulge in all year. Pumpkin packs a powerful one-two punch when it comes to skin care, says dermatologist Audrey Kunin. It contains powerful alpha hydroxy acids, a natural fruit acid that helps lift away old skin cells to reveal a radiant, more luminous complexion, plus vitamin A, which helps increase the rate of cell renewal to unveil younger-looking, softer skin. One of the most nutrient-rich foods out there, pumpkin is packed with disease-fighters, especially a turbo-charged combination of carotenoids, says Dr. William Clower, author of The Fat Fallacy. 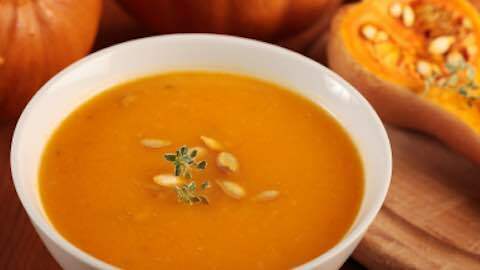 According to Clower, the National Cancer Institute estimates that up to 30 percent of all cancers can be prevented by eating the right foods, such as those rich in carotene, like pumpkin (just a 1/2 cup serving satisfies twice the recommended intake of alpha-carotene and 100 percent of beta-carotene). There’s a reason your mom made you finish your carrots: Like our friend the pumpkin, they’re loaded with beta-carotenes, an antioxidant with serious oomph. Not only is beta-carotene responsible for pumpkin’s lovely, deep-orange color, it also provides potent protection against free-radical damage caused by the sun’s harmful rays. Applied topically, pumpkin extract can even enhance the effect of sunscreen and shield skin from other environmental factors, including air pollution, stress and secondhand smoke. The spicy scent of pumpkin is a surefire way to inject some sizzle into those stay-at-home evenings with your guy. According to studies at the Smell & Taste Treatment and Research Foundation, the smell of pumpkin is probably one of your man’s top-rated aphrodisiacs. It’s also been proved to increase sexual functionality in both men and women -- one more reason to serve pumpkin ice cream or light a pumpkin candle on a random Tuesday night. Want a no-fuss, no-muss alternative to the sometimes-awkward gourd? Try pumpkin seeds; they’re notable for being a great source of zinc and omega-3 fatty acids, both of which not only help promote healthy bone density but can also sharpen your brain skills. Rich in essential fatty acids, pumpkin is an effective way to diminish fine lines and wrinkles, says skin care expert Kimara Ahnert. It’s also loaded with vitamin C, which has been proved to spur collagen production and prevent the breakdown of elastin. Pumpkins are also jam-packed with sodium hyaluronate to help hydrate and plump skin. Looking to improve your dental care? Try a little pumpkin seed oil when cooking; it’s used to effectively help with the prevention of cavities and tooth decay. Dana Wagner has held positions at Vogue and Gotham, and she is the fashion and beauty director of Bridal Guide magazine. Woman to Woman: "Surprising Benefits of Pumpkin"